How many times has it happened that we go out shopping and end up wasting a lot of our valuable time while standing in long queues at the checkout counter? And, sometimes when we reach the billing counter, we later realize that we are short of cash or in the worse case, we forgot our wallet at home! Well, the same happened with Neeraj & Devarshi while shopping during Holi festive season at a supermarket. The rush was huge and the waiting time was totally frustrating. It was difficult for customers as well as retailers to manage things smoothly. So, seeing this very common problem for most of the people and retailers they decided to solve this problem in a much simpler and cost-efficient way! They developed a self-checkout app named “SkippQ” that gives customers the superpower to skip long queues while shopping and also help them save their valuable time & money. How does the SkippQ app work? 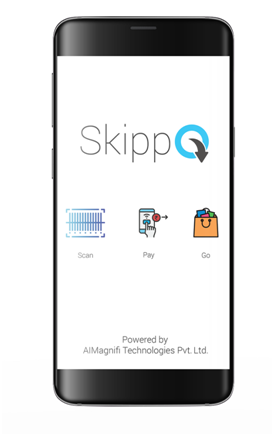 SkippQ is a Self-Checkout app for faster checkouts and seamless shopping experience. It enables the customers to just “Scan, Pay and Goes” out seamlessly. Using SkippQ, they can also keep a live track on the product offers and also check their expenses in the app’s virtual cart that helps them to avoid going over budget. Even if they forget their wallet at home, SkippQ will help them to purchase things and allow them to do online payments (UPI, e-Wallets & Credit/Debit Cards) through the app itself. The self-checkout app will be available on Google Play and Apple Store to the end customers. Once a customer downloads the app, he/she will be required to login. The app’s homepage will showcase the entire list of partnered stores and after selecting any of the stores; it will enable the customer to self-checkout and will also provide all new offers that are running at that time. The information of the product scanned will appear on their smartphone’s screen with the details of price and quantity. After adding products to cart, the app will ask customers to pay. They will be provided with multiple payment options like a credit card, debit card, UPI, e-wallets, internet banking and etc. The app has an integrated loyalty program that will be visible under payment options. SkippQ is developed by 2 engineering graduates Neeraj Kumar & Devarshi Mishra. After passing out from KIET, Ghaziabad in 2015, they worked in IT industry for more than 2 years and later on, both of them left their jobs and pooled their entire savings to make an impact in the offline retail segment using the power of AI. The team recently on-boarded Mr. Saarthak Bakshi (CEO, IFC | Forbes 30 under 30 Asia) as Strategic Advisor to their company AIMagnifi Technologies Pvt. Ltd. in order to strengthen the team’s leadership position in its core markets. After taking a year to develop the technology, the team is currently an on-going couple of pilot programs in Delhi-NCR and looking forward to testing before launch. Currently, in retail, they are targeting hypermarkets, supermarkets, grocery and apparel stores and in the later phase, they are planning to cover F&B space as well. Is the retail market ready for this? In this digital era of online shopping, there are more than 90% of the people who still prefer to go out for offline shopping in order to spend time with their loved ones. People still like to touch and feel the items before buying it. But standing in long queues spoils the overall experience & that’s the pain most of the people complain about. In last one and half year Amazon Go, Hypercity, Future group, Croma retail and Zara app has already shown the potential of self-checkout in India and abroad. Also, the customers have started adapting latest technological advancements in the retail industry. The team believes that this is the right time to make an entry into this market segment as people have easy access to smartphones and they also have developed a taste for digital mobile payment & smart stores. Why Crowdfunding & How SkippQ app managed to raise INR 1.36 lacs in less than 3 weeks? Seeing the overwhelming response from general public they are thrilled to launch their product soon. Catapooolt is a crowdfunding ecosystem for those who not only believe in the power of ideas but also want to be part of the change they wish to see happen. Whether it’s your project or someone else’s you support, we will bring together communities, relevant partners, latest tools and resources to enable what every idea needs to be successful – Funds and Engagement. Welcome to the future of funding ! !